The bottling line at the East African Breweries Limited plant in Ruaraka, Nairobi (file photo). Through lawyer Peter King'ara, the firm has sued the Inspector General of the Police and the Director of Public Prosecutions and listed EABL together with its local subsidiary Kenya Breweries Limited (KBL) as interested parties in its case. 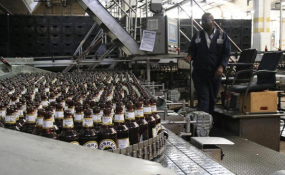 "The respondents' officers in collusion with the interested parties have lodged a countrywide campaign of illegally, maliciously confiscating and detaining FRM's beer products as well as intimidating and arresting its agents, distributors and retailers who form part of the supply chain alleging that the goods are counterfeit," said Mr King'ara. He added: "The firm is apprehensive that its agents, distributors and retailers will continue to be exposed to incarceration with the intended consequences of unjustifiable loss of liberty and business yet they are duly licensed, these actions are meant to stifle competition and drive FRM out of business."